So it's Christmas Day - the planning, wrapping and receiving has probably all already happened. But I have to get on my preachy horse here and ask everyone to gift another gift - a charity one. And in a Friends style situation it's almost more of a gift to yourself because we all know doing something good makes us feel better about ourselves. Especially when we're sitting surrounded by all our expensive gifts and family with Christmas films on and a glass of bubbles. 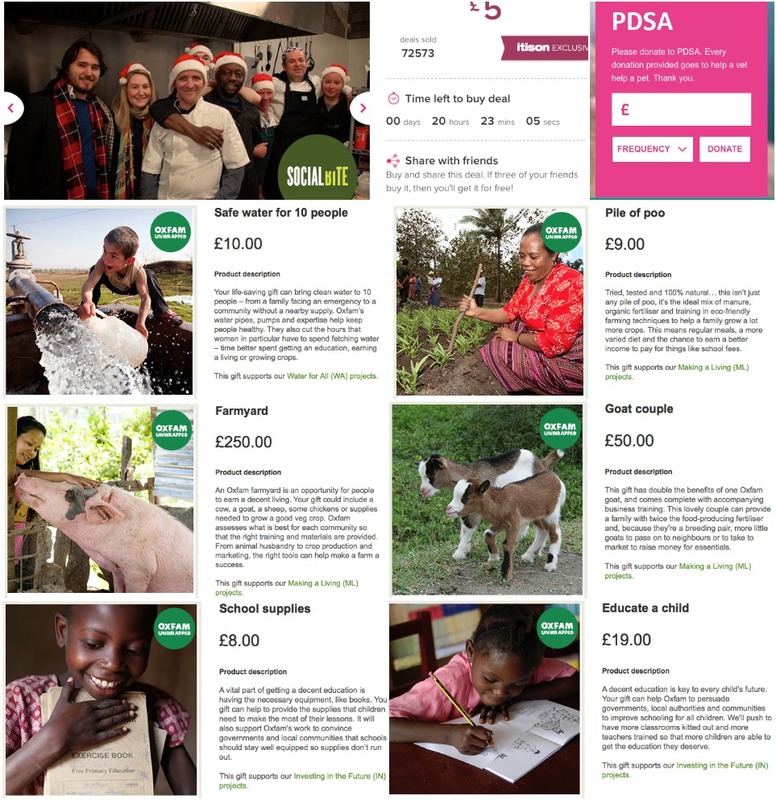 All of the above things can be bought online and the money goes automatically to the cause so, no matter what your budget, I've got something you can go for to give a little back today - and those Oxfam gifts come with an E-Card as well, if there is anyone turning up for Christmas lunch whom you might have forgotten to buy a gift for! 1. First up is for those in Scotland - as I'm sure you know Social Bite are a fantastic company which is a social business. This means that those who own the business get paid a salary but will never benefit from profit growth - after the staff and running costs of the business have been paid the profits go entirely to helping social causes (you can read more here). They also run an initiative where when you go to the cafe you can purchase in advance a food or dink item which can then be claimed by a local homeless person - so unlike some bigger charities you know exactly where your donation is going. To buy a hot meal for a person you can text BITE00 £5 to 70070 all year round, but Itison have been running the initiative where you can buy a homeless person a Christmas Dinner for £5, the voucher can be purchased here. Time is running out on that one, but the text code will work after Christmas Day. 2. For animal lovers the PDSA are a wonderful charity who provide vet services to people who would not be able to afford the care required for their pets. I'm sure I'm not the only one who cried buckets at that episode of Supervet. Although there is part of me that complains about people taking on the responsibility of animals when they can't afford to provide for them (and believe me, it's something I do think needs to be regulated, and not just from a financial side, there are far too many people with animals who don't deserve them) anyone with a pet knows just how massive a part of your life an animal becomes and to risk losing them because you can't afford the potentially live saving operation they need would be heart breaking. On the PDSA homepage there is an option to donate on a once off basis or on a monthly basis - and even those one off donations do add up. It's Christmas guys! 3. Oxfam run gifts for every budget and for £10.00 you can purchase Safe Water For 10 People. Clean water is a necessity to life and I'm sure half of us don't even think about the fact we can turn on a tap and have clean water directly to our homes - hot or cold on demand. The systems brought in to provide the water don't just do that - by bringing water to the area it also saves girls and women from walking for miles every day to fetch water, which means they have more time to hopefully get an education and improve their quality of life. 4. For anyone in your life with a sense of humour you can buy a Pile of Poo for £9.00 - I know there are a few people in my life who would giggle at that! The poo works as a fertiliser for crops and the gift also includes training in farming methods - the hopefully increased growth of crops means a family can feed themselves on a more regular basis, as well as generating crops for selling and providing an income. 5.If you're feeling particularly generous for £250 you can gift a community with a Farmyard. Each community is assessed individually as to what animals would most help - animals produce milk, fertiliser for crops and can be used to help work machinery that can improve the efficiency of the growth of crops. 6. Along the same lines for £50 you can provide a Goat Couple for a family. The goats produce milk and fertiliser,and the gift also includes business training along with the goats. The fact these two are a couple increases the chances of a few baby goats being produced as well, which means the family can sell the goats at market to raise income, or pass them on to other family members or neighbours. 7. & 8. Just £8.00 provides School Supplies for a child. As I'm sure regular readers of my blog/viewers of my YouTube channel will know I am massively passionate about education and would stay at uni doing degree after degree for the rest of my life if it was possible. Although I am aware of how lucky I am to be able to pursue an education it isn't something everyone gets access to, especially not those from impoverished backgrounds. For £19.00 you can Educate A Child, which improves their chances of getting a good job and not staying stuck in poverty rut. Not pictured is the option for Teaching a Teacher for £27.00, which trains people to become teachers - giving both that person a career and opening the opportunities for children in the area to get an education. Everyone wins. I'm not going to lie. I could use some links for SEO purposes. On the bright side, you'll be helping save countless souls from months if not years of torment and poverty. Thanks.